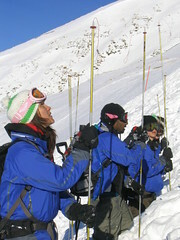 This past week I have been up a mountain recording and participating in an avalanche safety training course. It has been really interesting and I have noted heaps of ideas on ways online learning could compliment and enhance the learning in this course. But for now, I’m just noting here that I absolutely snowed under with stuff going on this week. There have been a number of people asking where I am with my commitments (Alex, online learning communities course, Otago Poly staff).. and I just don’t know how long its gunna take to dig out of this! My email is 3 screens deep! My phone has 8 unanswered messages! and my to-do list is… well, I don’t even know where it is anymore! On September 30, Sunshine and I will be getting married. That’s only 2 weeks away and we have 50 friends and family to look out for – most coming from over seas… So at this point, I think I’ll just have to put the majority of these other things on hold and prioritise this day. Interesting to notice even though we talk quite a bit, I don’t know much about your life outside of work (apart from the odd climbing story). I didn’t even know you were planning to get married. Congratulations!!! Can relate to feeling snowed under. Arrgh. Poor Leigh I can actually feel your pain at the moment. In fact I think I am should start up a community to learn that art of saying NO because the trouble is we agree because we think it is a quick task only to find out that it is TOTALLY TIME CONSUMING. Unfortunately the people that ask us forget to think about our own demands. Any way have a great wedding and as you said this is what you need to focus on. IF you have taken on too much you need to tell people to make alternative plans. Congratulations and best wishes. Hope you have wonderful day. Wish I could be there mate but with a new born bub and a broken knee it’s not going to be possible. I totally understand where your at. Most people just need a definitive answer. That easy. I know your trying to cover all bases and it’s just not possible. I’ve learnt in life….dont put yourself out more than you can achieve. The man with three kids to three different mothers. Be cool…..and say hello to Sunshine & family for me. I hope you can relax and enjoy your wedding. Have a great time! What on earth are you doing up a mountain a couple of weeks before you get married? We will miss your presence in the online learning course but we are getting pretty good at being innovative and getting by I think.